Forward Martin St. Louis announced his retirement Thursday. 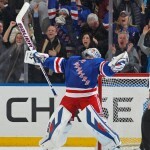 He had 21 goals and 52 points in 74 games with the New York Rangers last season, the final year of his contract. “I have been blessed to play for 16 years in the NHL; it has been an amazing ride,” St. Louis said in a release issued by the Rangers. “I would like to thank the Tampa Bay Lightning and New York Rangers organizations and owners for providing me the opportunity to play the sport I love for so many years. I could have never played for so long or accomplished all that I have without the unwavering love and support from my wife, Heather, our three sons, Ryan, Lucas, and Mason, and my parents. St. Louis, who turned 40 last month, had 391 goals and 1,033 points in 1,134 regular-season games in 16 seasons with the Calgary Flames, Lightning and Rangers. In 2004 he won the Art Ross Trophy, the Hart Trophy and the Ted Lindsay Award while helping the Lightning win the Stanley Cup. In 2012-13 he led the League with 60 points in 48 games, and at age 37 became the oldest player to win the Ross. St. Louis also won the Lady Byng Trophy three times, and skated in the NHL All-Star Game six times. Martin St. Louis was one of the smallest athletes to ever play in the NHL, however St. Louis played with a lot of heart that may sound cliché but in this case it’s true. His compete was simply at a higher level than most players. Despite, leaving Tampa Bay was some bad blood two years ago for New York. St. Louis will forever be regarded as a player who put the Tampa Bay Lightning on the map. Now that, St. Louis retirement is official it is safe to say, that the Tampa Bay Lightning won the trade getting Ryan Callahan and to first overall picks. With that being said, Martin St. Louis Will always be remembered as one of the Classiest guys Whoever played this game. It is really too bad he did not succeed in winning second Stanley Cup. Nonetheless, your hockey resume is impressive. It was a pleasure watching your career. Enjoy your retirement Marty!